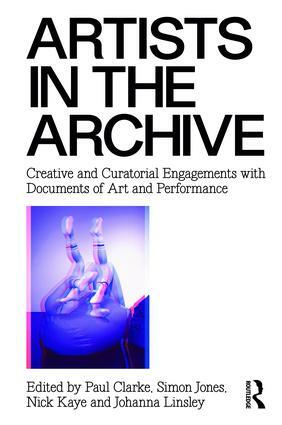 Artists in the Archive explores the agency and materiality of the archival document through a stunning collection of critical writings and original artworks. It examines the politics and philosophy behind re-using remains, historicising this artistic practice and considering the breadth of ways in which archival materials inform, inflect and influence new works. Taking a fresh look at the relationships between insider know-how and outsider knowledge, Artists in the Archive opens a vital dialogue between a global range of artists and scholars. It seeks to trouble the distinction between artistic practice and scholarly research, offering disciplinary perspectives from experimental theatre, performance art, choreography and dance, to visual art making, archiving and curating. 3a Janez Janša, Monument G as a call for reconstruction. 3e Zhang Huan, Six Questions. 4. Adrian Heathfield, The Ghost Time of Transformation. 12. Simon Jones, The Future Perfect of the Archive: re-thinking performance in the age of third nature. Paul Clarke is an artist, theatre director, and Senior Lecturer in Performance Studies at the University of Bristol. Simon Jones is Professor of Performance at the University of Bristol, a writer and scholar, and founder and co-director of physical theatre company Bodies in Flight. Nick Kaye is Professor of Performance Studies at the University of Exeter. Johanna Linsley is an artist, researcher and producer, a founder of the performance/producing collective I’m With You, and a founding partner of documentary arts centre UnionDocs, Brooklyn, NY.